I was lucky enough to move into a new house at the end of last year with a beautiful little back garden which faces onto a tranquil canal. Last weekend I lifted some of the gravel from a small 3m x 1m space beside the back door, laid down some compost and planted a climbing rose and a clematis – hopefully they will navigate their way up the side of the house and create some nice colour and scent for us to enjoy as we sit out eating dinner. 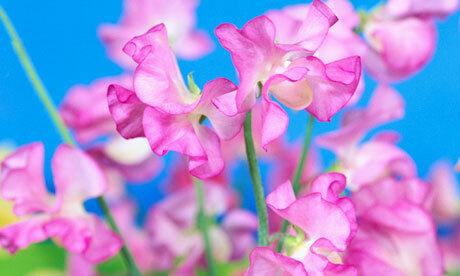 Sweet peas – as many as possible -an absolute must. Perfect for cutting and using in flower arrangements too – they’ll fill any room with a beautiful sweet fragrance. Lavender –nice and hardy, easy to grow. I recommend buying a small plant from a garden centre, rather than growing from seed as it can take 2 years to flower. Peony – a beautiful big pink flower, perfect for cutting. Read up on scented varieties before you buy. There’s an old saying ‘never move a peony’ as they don’t like getting shifted. For me the best reason to grow a plant is its smell – whether that’s to make a room smell naturally beautiful or to fill you with nostalgic memories of childhood. That’s just a few of my recommendations. If you’re interested in making your garden a ‘fragrant paradise’, read this fab article in the Telegraph gardening section online which offers lots more ideas.